Chic on a Shoestring Decorating: Are ugly lamps bringing your room down?? Are ugly lamps bringing your room down?? They are so much more important than people give them credit for. They are not merely for putting out light, they are also an important decorative accessory. 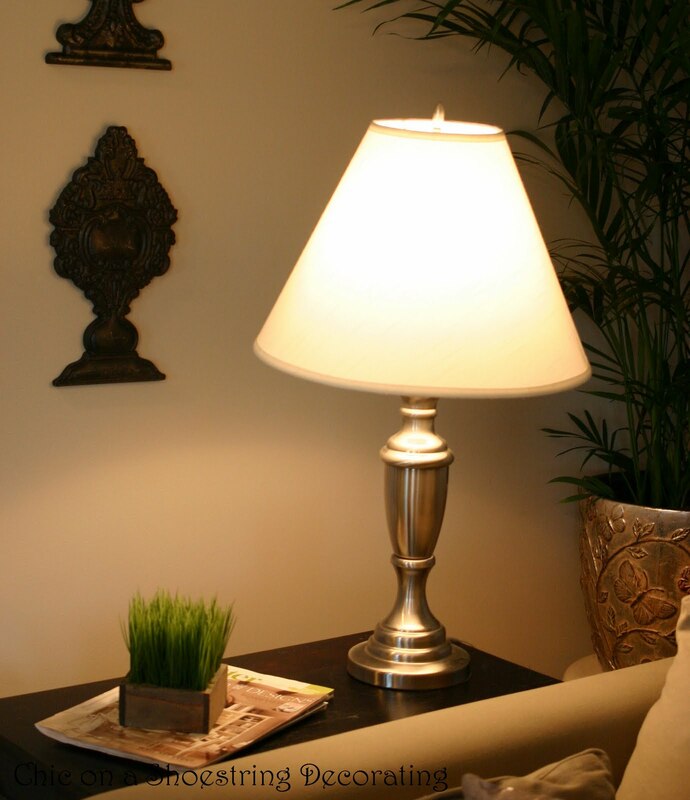 A lamp and it's shape, color, size, shade and placement can make or break a room. 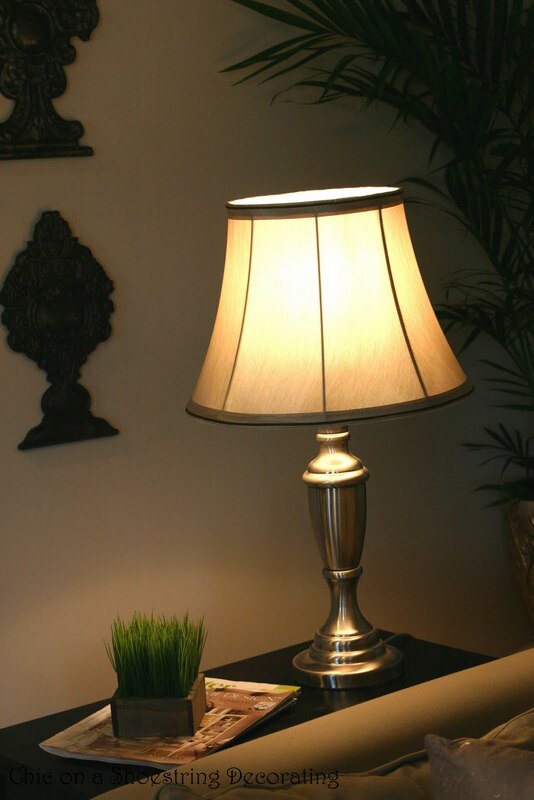 The biggest lamp faux pas I see over and over again is a too small lamp for the space or a lamp with too small of a shade for the base. These lamp faux pas drives me nuts! This shade is way too small for this lamp... but the crookedness and the big dent adds a nice touch. I like to call this the "Brokeback Mountain" lamp. Seriously?! That is an actual lamp! That ugly thing would definitely break the beauty of any room. There are so many options out there to buy or re-make an inexpensive lamp that no one should have to live with either of those ugly things. The thrift shops are full of old, cool shaped lamps that are just needing a can of spray paint and a new shade. Wal-Mart has really improved their line of lamp bases with mix and match shades. Most average size lamps are around 18.99 with around a $14.99 shade. Target has a great selection too but come in a little pricier than Wal-Mart. TJ Maxx/Homegoods/Marshalls are great places to find unique and higher-end lamps for great prices. Anywhere from $9.99 for small ones and larger ones are about $29 to $39. Since I like lamps so much and they are such an important design aspect of a room I get a little bent out of shape if my lamps don't look right. I had some nice brushed silver bases that I bought at Wal-Mart several years ago. I decided that I didn't mind the base but the shade was BOOOOORRRRIIIIIIINNNNNNGGGGGG.... snooze. I went "grocery" shopping at Wal-Mart and picked up a new lamp shade. ﻿Much better!! And, if you're still awake, you may have noticed this lamp is sitting on a different table. I moved the set to my husband's man cave because I found some sweet lamps for a sweet deal for our family room! These pictures just don't do these pretty lamps justice. I might have to take some more tomorrow with better lighting. The best part is that these shiny, lovely, sleek lamps were on clearance at Gordman's for $24 each AND they were 50% the clearance price. I got them for $12 each!!! Woot, Woot! You friends know how I love a sweet deal and this was a suh-weeet one! I love the sophisticated new look they add to my family room. They are very Z-Gallery-esque and I'm loving it! Do you have any lamp faux pas in your house? If so, you can fix it on the cheap... get going to Goodwill, no one deserves to live with bad lamps. Ha Ha, I love the Brokeback Mt. Lamp. Where can I get one? Great post. Girl, you are the only one that can make a post about lamps interesting. Great job! ah ha ha she said Brokeback mountain lamp...woo hoo funny girl! Good post....love the drum shade too!